Moog Servovalves and Proportional Valves are used in the most demanding motion control applications around the world. We have built a strong reputation on their reliability and versatile performance. 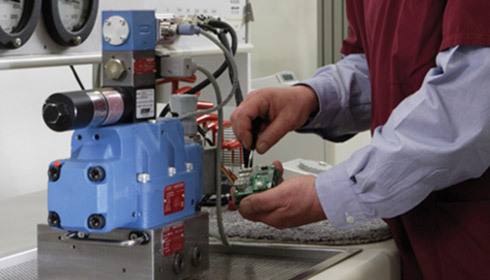 Whether your repair consists of an inspection, cleaning and calibration or part replacement, Moog is the only one with the expertise and global systems to ensure quality repair by using original parts. Moog offers a variety of repair levels from an initial evaluation test to a high level repair which could include a full strip down, ultrasonic clean, replacement or repair of a torque motor, re-push nozzles and re-shim, as well as replacing the bushing and spool assembly. Further details can be obtained from your local service center. Should you find we no longer manufacture a particular servovalve, we will offer the latest valve design to help you upgrade your facility. This allows you to take advantage of the latest improvements and assure a continuous supply. Many locations also offer a convenient trade in program which ensures your machine continues to run at the performance level you need. Moog Global Support means both the highest quality and a superior level of service. Quality is assured through a process that starts with our special automatic test stands, where we accurately evaluate the level of repair you need. It continues with repairs by expert technicians using Moog designed and manufactured replacement parts as required. The end result is global consistency of our repairs and a product that functions like new.